If there is one thing that Akshay Kumar values above everything else, it is relationships. Like his relationship with his father. The actor, who stars in the recently released film, Boss, spoke to Rediff.com's Savera R Someshwar about his ambitions and explains why certain relationships are such an important part of his life. You come across as a very easy-going person, so what it is like to be a boss in real life? The first rule of my office is that I am not the boss. My staff has been with me for 15, 20 years. I find that impressive because it is a reflection of their character. They have stuck it out with me. They have been loyal. My driver has been with me for the last 20 years. My make-up man has been with me for 24 years; he joined me when I entered this industry. I believe that you have to look forward to your work; you should not have to do it reluctantly. If my staff comes to work on time, it is because they enjoy their work. I make sure they enjoy their work. I have another simple premise. If you want your staff to be happy, if you want them to stay with you forever, ensure that their families are happy. I believe that, if your family is happy, then you are happy. For someone who believes that you are your own boss, do you have a boss? My bosses are all my producers; all the corporates I work for. Image: Akshay Kumar talks about the relationships that he values the most. Relationships seem to be very important to you. Is it true that one of the reasons you did Boss is because the film is, among other things, about the relationship between a son and his father? Yes. I love this relationship. I also did Waqt and Ek Rishtaa because they were about the father-son relationship. Then I did Jaanwar, where I played a father. I cherish the fact that I had a great rapport with my father. The father-son relationship is generally the underdog relationship in this world, especially in this industry. Do you know we don't have a single song dedicated to fathers? Maa ke upar kayi gaane hain (There are many songs dedicated to mothers). Rakhi ke bandhan pe gaane hain (There are songs dedicated to Raksha Bandhan). Behen ke upar gaane hain (There are songs dedicated to sisters). Dostana pe gaane hain (There are songs dedicated to friendship). Do doston ke upar gaane hain (There are songs dedicated to friends). Lekin bechare baap pe kisi ne gaana hi nahi banaya (But the poor father, there is no song dedicated to him). This relationship has been taken for granted. Yes, I understand that mothers are very, very important. Without them, you are incomplete. But do give a little credit to your father too. Make a song for that poor man also. He goes out to work, brings home the money, toota haara ghar aata hai (returns home exhausted), then makes his son study or helps with other stuff. We have that song, dedicated to fathers, in Boss. It's called Pitah Se Hi Naam Tera. 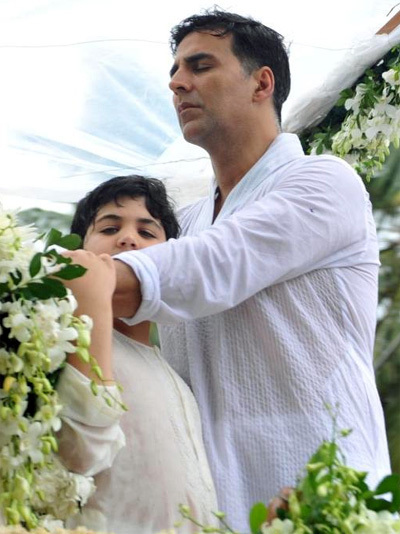 Image: Akshay Kumar with his son Aarav. You've reached a certain landmark in terms of your age. Looking ahead, how do you see your career shaping up? What do you see yourself doing? I have spent 25 years of my life in this industry; I don't know how to do anything else. If you pull me out of this industry and ask me to survive somewhere else, it will be difficult for me. I see myself in this industry only. I'll be here till they shoot me. Is there any actor whose lifestyle you admire? He is a man who has, literally, lived his life completely. He is still living his life as if he were a young boy. Image: Akshay Kumar is fond of using the word Khiladi in his movie titles. After completing a quarter of a century in the industry, what do you think is your legacy? What, do you think, are the highlights of your career? I cannot specify any particular thing. Every day is a big highlight. Something or the other keeps happening every day. When you look back, you do you feel most of proud? What future do you see for your production company? What kind of films you see yourself making? I may be doing commercial cinema, but I want my company, Grazing Goat, to make films which will make a difference to society. That is why my partner (Ashwini Yardi) and I have made films like Oh My God and 72 Miles Ek Pravas. We are making Marathi films too. Image: Akshay Kumar plays Krishna in his home production, Oh My God. You are known to be a very savvy investor. Where did that come from? Maybe because my father was an accountant (smiles). Fame kills privacy. Does that bother you? My family and I have our private moments, even in Mumbai. I don't think fame has killed our privacy. Image: Fans gather to watch Akshay Kumar shooting for Boss. You have great comic timing as an actor. The fact that you can make people laugh -- how does that make you feel? Oh, I feel very good when I make anybody laugh. When people ask my co-actors what working with Akshay was like, and they say he makes us laugh all the time, it makes me feel very good. The fact you have the knack to make people laugh is a very big thing. I believe laughter is the best medicine. This means I am carrying a medicine around with me that allows me to make people happy. Image: Akshay Kumar poses for photographer Daboo Ratnani. Review: Akshay Kumar's Boss: All title, no thunder! PIX: Have you noticed Amitabh Bachchan's eyes before?